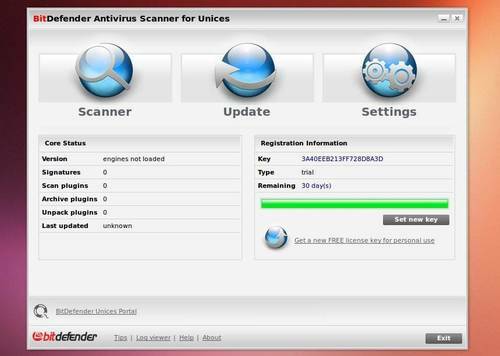 This tutorial shows how to install BitDefender Antivirus Scanner in Ubuntu 13.10 Saucy or Linux Mint 16 Petra from bitdefender repository. Bitdefender is an antivirus software suite developed by Romania-based software company Softwin. You can use the Free Edition on Ubuntu Linux to scan remove devices and ntfs partitions. Once installed, restart your computer and you’ll see the shortcut icon in Unity Dash. BitDefender Anti-virus is available for Linux from its official repository. Here I’ll show you how to install it on Ubuntu 13.04 Raring Ringtail. Ubuntu itself has few virus, you can install anti-virus program on Ubuntu Linux to scan USB devices or Windows NTFS partitions. To get started, press Ctrl+Alt+T key combination to open terminal, then run below command to add BitDefender official repository for Linux. Once installed, run GUI via below command. Read this tutorial to manually add a launcher.